The latest poster for Netflix’s award-winning, binge-worthy series Stranger Things has just unveiled a new poster for season two. 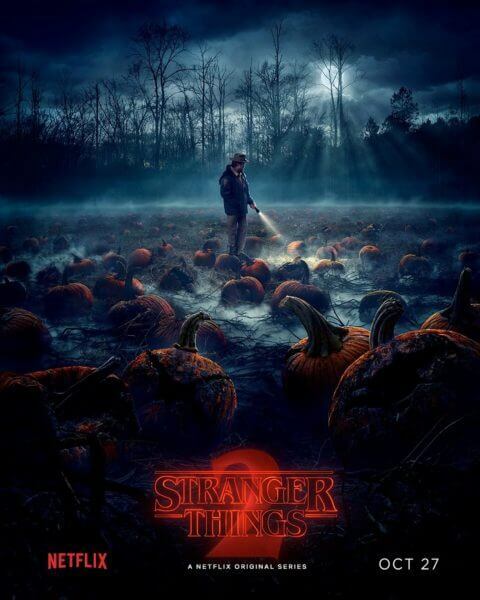 The new poster features returning series stars David Harbour as Police Chief Jim Hopper standing in a field of pumpkins resting in fog. In addition to Harbour, returning cast members also include Winona Ryder (Joyce Byers), Charlie Heaton (Jonathan Byers), Natalia Dyer (Nancy Wheeler), Millie Bobby Brown (Eleven), Finn Wolfhard (Mike Wheeler), Caleb McLaughlin (Lucas Sinclair), Gaten Matarazzo (Dustin Henderson), Joe Keery (Steve), and Cara Buono (Karen Wheeler). Stranger Things season two is set to premiere on October 27, 2017. And the Stranger Things 2 Plot: It’s 1984 and the citizens of Hawkins, Indiana are still reeling from the horrors of the Demogorgon and the secrets of Hawkins Lab. Will Byers has been rescued from the Upside Down but a bigger, sinister entity still threatens those who survived.